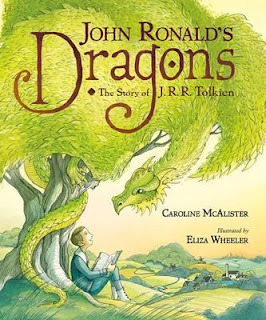 When I heard there was a picture book about JRR Tolkien, I just had to have it! Tolkien was the master of fantasy. He brought Middle-earth to life in the imaginations of generations of children and adults alike, taking us on a journey to Mordor and introducing us to hobbits, elves, dwarves and wizards. But who was he? What was he like as a child? How did he create these amazing worlds which encompassed us, enveloped us and transported us to another realm? This ambitious book introduces us to young John Ronald. A boy ‘who loved horses. And trees. And strange sounding words’. But most of all, he loved dragons. All sorts of dragons. John Ronald listened intently as his mother read stories about knights and dragons and battles. He saw them, he imagined them, he dreamt about them. John Ronald grew up, went to school, and made up secret languages with his cousin Mary in their school holidays. His life was marred by tragedy. When his beloved mother died he was sent to live with an aunt in her ‘cold and lonely’ house, where he dreamt of his dragons to keep him company. A few years later, he found himself at war, witnessing the darkness and devastation of real battles and fire breathing tanks. One day, John Ronald picked up a pen and wrote, ‘In a hole in the ground there lived a hobbit’. He named his hobbit Bilbo Baggins and began to tell his children stories about him. Bilbo led John Ronald on a journey. A journey to find the ultimate dragon. A journey to find Smaug. The illustrations in this book are gentle and expressive. They depict a quiet and friendly young boy and his imaginary dragons. John Ronald’s facial expressions tell of his emotional journey and the colour palette is soft with green tones to represent the English countryside that inspired the Shire. The endpapers are also thoughtfully designed, with stylistic green dragons merging with intertwining green trees. There are detailed author and illustrator notes at the end, which include information about Tolkien’s life, including a catalogue of Tolkien’s dragons and quotes from his scholarly writing on dragons.